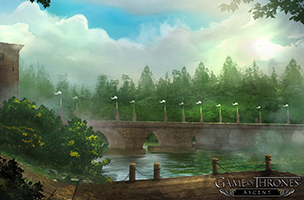 Disruptor Beam and HBO have announced the launch of Game of Thrones Ascent on iPad devices. Previously released on Facebook (our review) and Kongregate, the game takes players to the world of George R.R. Martin’s Westeros, and follows along with the plot and story lines shown in the HBO television show. In Game of Thrones Ascent, players complete thousands of story-driven quests as they dive into the lore of the universe. The game allows users to choose their loyalty to one of the Great Houses, ruling their own holdings and building their forces for battle. The game offers both alliances for cooperative play with other real-world players, as well as player-vs-player features. Season 4 of the Game of Thrones television show will premiere on April 6, with gamers given a chance to experience content from the new season each Monday after the premiere of a new episode. For this mobile release, the game has been optimized for Retina displays and iOS 7, and offers a redesigned user interface to take advantage of the mobile touch screen. The game also offers Game Center leaderboards. Game of Thrones Ascent is now available to download for free on iPad, and is in development for Android devices. Check back soon to follow the game on AppData, our tracking platform for mobile and social apps and developers.